Make Your Own Cookie Box – Easy! December 12, 2010 9:10 am By Lori Post contains sponsored/affiliate links and I get commissions for purchases made from links. As an Amazon Associate I earn from qualifying purchases. 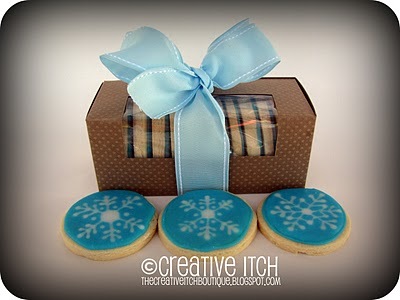 Head over to The Creative Itch to see how she made this Cookie Box with a piece of cardstock. I am crazy about this idea! Did you round your lid corners like she suggested? If so, did you use a special tool or just cut a curve? Sorry, I'm new to papercrafting! Thanks for sharing, I LOVE these boxes!